Background: Slum-resettlement communities are increasingly adopting urban lifestyles. The aim of this study was to assess the prevalence and identify correlates of hypertension among residents aged 20-59 years of a slum-resettlement colony. Materials and Methods: A community-based cross-sectional study was done from 2010 to 2012 in NandNagri, a slum-resettlement area in east Delhi. 310 participants aged 20-59 years were enrolled through multistage systematic random sampling. Each study subject was interviewed and examined for raised blood pressure; data on risk factors including smoking, alcohol intake, physical activity and salt consumption were also collected. Data were analysed by use of univariate and multivariate regression. Results: The overall prevalence of hypertension was 17.4% and 35% participants were prehypertensive. On multiple logistic regression, age 40-49 years (P = 0.020) and 50-59 years (P = 0.012), clerical/professional occupation (P = 0.004), abnormal waist circumference (≥90 cm in males and ≥ 80 cm in females; P = 0.001), positive family history of hypertension in both parents (P = 0.013) and above-average daily salt intake (P = 0.000) were significantly associated with hypertension. Conclusions: These findings indicate that hypertension is a significant health problem in the study population. Many study participants diagnosed with prehypertension are at risk of developing hypertension, thus immediate public-health interventions are indicated. In Delhi, as in the capital cities of other developing countries, slum-resettlement populations are growing rapidly and their vulnerability to certain diseases is increasing as they adopt urbanized lifestyles. Reliable epidemiological data on the prevalence of hypertension and in these populations are scarce; indeed, few community-based studies of hypertension have been done in Delhi. Nevertheless, it is clear that hypertension in India, once considered limited to the elderly and higher socioeconomic groups, is becoming prevalent in younger age groups. , The aim of this study was to assess the prevalence and identify the correlates of hypertension among adult residents of a slum-resettlement colony in east Delhi. This community-based cross-sectional study was done in NandNagri, a slum-resettlement area in East Delhi, between August 2010 and February 2012. Nand Nagri, which is within the field-practice area of the Department of Community Medicine, University College of Medical Sciences, Delhi, has a population of more than 50 000, most of whom have a low socioeconomic status. Ethical clearance for this study, as per university norms, was obtained from the Institutional Ethics Committee for Human Research. Written informed consent was obtained from the study participants. The sample size was calculated − with an anticipated prevalence of hypertension of 27.5%,  5% absolute precision, 95% confidence interval and 10% nonresponse error − as 310 participants aged 20-59 years. The study participants were selected by multistage systematic random sampling. One sub-block was randomly selected from each of the five blocks of the study area. The sampling unit was a household, which was randomly selected from the first 20 households (sampling interval for 5%). Thereafter, starting from that residence, every 20 th household was selected. All people aged 20-59 years residing in the selected household for 6 months or more were included in the study. If there was no eligible participant in the selected household, or if the house was closed for three consecutive visits, that sampling unit was replaced by a contiguous household without disturbing the allocation of next 20 th unit. The cut-off point for average salt intake was set at 5 g per day. Regular exercise was defined as at least 45 min of physical activity of moderate intensity for at least 5 days in a week. Regular intake of alcohol was defined as consumption of more than two alcoholic drinks (about 30 ml of ethanol) for at least 5 days per week. Evidence of target organ damage/clinical cardiovascular disease was captured from available medical records and corroborating history. Sociodemographic data of the participants, including age, educational and occupational status, family type and individual income were also recorded. Information on nonpharmacological antihypertensive measures undertaken by participants was elicited by in-depth enquiry. All interviews and examinations were conducted by single investigator. Data were analysed by use of SPSS version 17.0. To determine the risk factors associated hypertension, univariate and multivariate regression analyses were done. Univariate odds ratio estimation was followed by derivation of different multivariate models through logistic regression with forward entry and forward step-wise methods and the best multivariate derived model was selected. A two-tailed P < 0.05 was considered statistically significant. 310 participants aged 20-59 years were enrolled. Most participants were in the 20-29 years age group (139, 44.8%). Females (164, 52.9%) outnumbered males (146, 47.1%). 112 (77%) males were married. 69 (22.3%) participants were illiterate. Among males 17 (11.6%) were currently unemployed, while 142 (86.6%) females were homemakers or unemployed. In the year prior to the study, 259 (84%) had not had a health check-up and 168 (54%) had not had their blood pressure checked. [Table 1] shows the age-wise distribution of blood pressure among the participants. The overall prevalence of hypertension was 17.4% [Table 2]. The prevalence was slightly higher in men (17.8%) than in women (17.1%). 108 (35%) participants were prehypertensive. The prevalence was 5.7%, 19.3%, 31.9% and 36.6% in age groups 20-29, 30-39, 40-49 and 50-59 years, respectively. A significant age-related increase in the prevalence of hypertension was observed in both sexes. 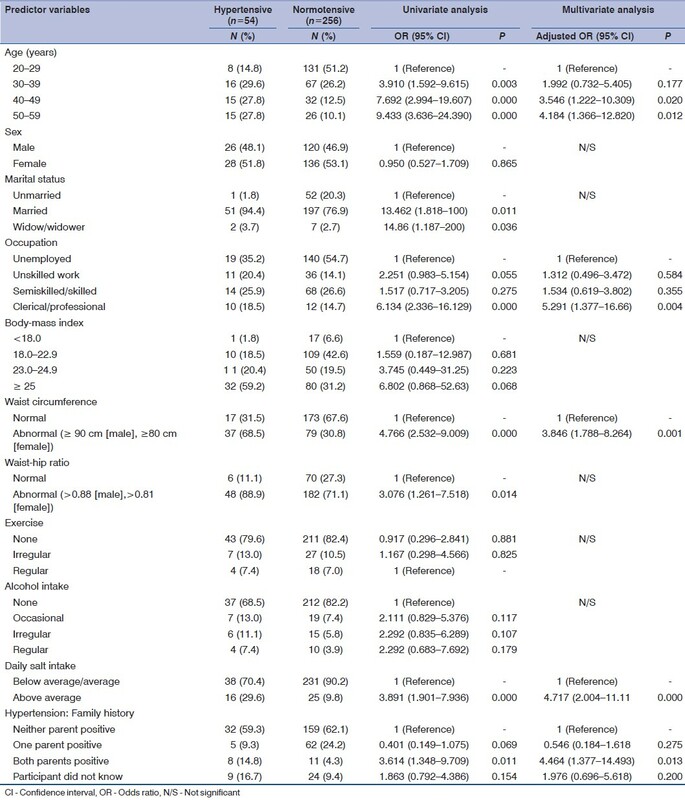 As shown in [Table 2], in univariate analysis of risk factors of hypertension, increasing age was associated with increasing risk of hypertension (P = 0.003, 0.000 and 0.000 for age groups 30-39, 40-49 and 50-59 years, respectively). Being married or a widow/widower was also significant risk (P = 0.011/0.036, respectively). In addition, the following risk factors were significant: Clerical/professional occupation (P = 0.000), abnormal waist circumference (≥90 cm in males and ≥80 cm in females; P = 0.000), abnormal waist-hip ratio (>0.88 in males and > 0.81 in females; P = 0.014), above-average daily salt intake (P = 0.000) and a positive family history of hypertension in both parents (P = 0.011). A history of hypertension in siblings was also significant (P = 0.000 and 0.000 with < 50% and ≥ 50% hypertensive siblings, respectively). On multiple logistic regression, age 40-49 years (P = 0.020) and 50-59 years (P = 0.012), clerical/professional occupation (P = 0.004), abnormal waist circumference (P = 0.001), positive family history of hypertension in both parents (P = 0.013) and above-average daily salt intake (P = 0.000) were found to be significant [Table 2]. The majority of the population in India has inadequate access to healthcare. More than half of outpatient consultations are with indigenous and private medical practitioners, who do not screen regularly for hypertension. Opportunistic, clinic-based screening therefore identifies only a small proportion of hypertensives and people with undetected hypertension do not seek care from the formal health sector until they are seriously ill. Community-based screenings can improve the detection and treatment of hypertension. In our study, about 77% males were married. The 2005-2006 National Family Health Survey (NFHS-3)  reported that 56.6% men in urban India aged 15-54 years were married. These differences may reflect the lower age limit of men included in NFH-3 than in our study. In the current study, 22.3% participants were illiterate. The 2011 census of India reported that 17.15% of the total urban population of the north-east district of Delhi were illiterate. The lower literacy rate in our sample may be attributed to the lower socioeconomic status of participants. The overall prevalence of hypertension in this study was 17.4% and was slightly higher in men than in women. Similar findings have been reported by others. , However, one previous study reported a hypertension prevalence of 27.5% in Delhi. The lower-middle and low socioeconomic status of participants in our study may account for the lower prevalence recorded; in addition, our study population did not have equal proportions of participants in all age groups. Our study showed that the prevalence was 5.7%, 19.3%, 31.9% and 36.6% in the age groups 20-29, 30-39, 40-49 and 50-59 years, respectively. Many studies have reported similar observations. ,, This clearly depicts that, as more of the population enter solder age groups, the burden of hypertension, will further increase. Regarding positive family history of hypertension, our study showed that of the participants with a family history of hypertension in one parent, 7.5% were hypertensive; among participants with whose parents were both hypertensive, 42.1% had hypertension. Yadav and colleagues reported prevalence of hypertension of 68.4% among participants with positive family history for hypertension. A positive family history of hypertension in parents or siblings is a significant hypertension risk factor that warrants further research. This study has several strengths. First, we have conducted a community-based study in an underserved population, i.e. residents of a slum-resettlement colony in east Delhi. By contrast with hospital-based studies, the cases detected were mainly at an early stage of hypertension thus there was an opportunity to sensitize and treat the participants and reverse the disease process. Second, to our knowledge, assessment of risk factors for younger age groups in underserved populations in India has not been extensively investigated. Very few similar studies are available in the literature. Third, study participants were enrolled by multistage systematic random sampling, which reduced selection bias and provided a better study design than cluster sampling. Fourth, all the interviews and examinations were conducted by single person, which provided uniformity in data gathering. The study also has some limitations. First, self-report bias and recall bias will have affected the validity of responses to questions about lifestyle such as alcohol or tobacco consumption and frequency of blood-pressure check-ups. Second, the study did not record the duration and quantity of tobacco consumption. Third, the findings emerging out of the current study cannot be extrapolated to the populations of all slums in India. Fourth, pregnancy-induced hypertension in the participants who were currently normotensive and not on any pharmacological or nonpharmacological treatment were considered normotensive. The findings of this current study indicate that hypertension is a significant health problem in this study population. Many of the participants identified as prehypertensive are at risk of developing hypertension, thus immediate interventions are indicated, including information, education and communication activities to generate and sustain health awareness; promote blood-pressure check-ups; and reduce mean sodium consumption at the community, household and individual levels. 1. Global Health Risks Summary Tables. Health Statistics and Informatics Department. World Health Organization: Geneva, 2009. 2. Chadha SL, Radhakrishnan S, Ramachandran K, Kaul U, Gopinath N. Prevalence, awareness and treatment status of hypertension in urban population of Delhi. Indian J Med Res 1990;92:233-40. 3. Ramaraj R, Chellappa P. Cardiovascular risk in South Asians. Postgrad Med J 2008;84:518-23. 4. Shah B, Mathur P. Surveillance of cardiovascular disease risk factors in India: The need and scope. Indian J Med Res 2010;132:634-42. 5. Chobanian AV, Bakris GL, Black HR, Cushman WC, Green LA, Izzo JL Jr, et al., Joint National Committee on Prevention, Detection, Evaluation, and Treatment of High Blood Pressure; National Heart, Lung, and Blood Institute; National High Blood Pressure Education Program Coordinating Committee: Seventh report of the Joint National Committee on Prevention, Detection, Evaluation, and Treatment of High Blood Pressure. Hypertension 2003;42:1206-52. 6. Physical status: The use and interpretation of anthropometry. WHO TRS 854-859. Geneva: World Health Organization; 1995. 7. Association of physicians of India. Consensus Statement for Diagnosis of Obesity, Abdominal Obesity and the Metabolic Syndrome for Asian Indians and Recommendations for Physical Activity, Medical and Surgical Management. J Assoc Physicians India 2009;57:163-70. 9. Provisional population totals- NCT of Delhi- Rural-urban distribution. Available from: www.censusindia.gov.in [Last accessed on 2012 Apr 5]. 10. Gupta R, Kaul V, Bhagat N, Agarwal M, Gupta VP, Misra A, et al. Trends in prevalence of coronary risk factors in an urban Indian population: Jaipur Heart Watch-4. Indian Heart J 2007;59:346-53. 12. Chaturvedi S, Pant M, Neelam, Yadav G. Hypertension in Delhi: Prevalence, awareness, treatment and control. Trop Doct 2007;37:142-5. 13. Deepa R, Shanthirani CS, Pradeepa R, Mohan V. Is the ′rule of halves′ in hypertension still valid?--Evidence from the Chennai Urban Population Study. J Assoc Physicians India 2003;51:153-7. 14. Wu Y, Huxley R, Li L, Anna V, Xie G, Yao C, et al. Prevalence, awareness, treatment and control of hypertension in China: Data from the China National Nutrition and Health survey. Circulation 2008;118:2679-86. 15. Kaur P, Rao TV, Sankarasubbaiyan S, Narayanan AM, Ezhil R, Rao SR, et al. Prevalence and distribution of cardiovascular risk factors in an urban industrial population in south India: a cross-sectional study. J Assoc Physicians India 2007;55:771-6. 16. Mohan V, Deepa M, Farooq S, Prabhakaran D, Reddy K. Surveillance for risk factors of cardiovascular disease among an industrial population in southern India. Natl Med J India 2008;21:8-13. 17. Intersalt Cooperative Research Group. Intersalt: an international study of electrolyte excretion and blood pressure. Results for 24 hour urinary sodium and potassium excretion. Br Med J 1988;297:319-28. 18. Yadav S, Boddula R, Genitta G, Bhatia V, Bansal B, Kongara S, et al. Prevalence and risk factors of pre-hypertension and hypertension in an affluent north Indian population. Indian J Med Res 2008;128:712-20.